After suffering religious persecution in Missouri and Illinois, Mormon leaders looked to the west to establish a home where Mormons (Latter Day Saints) would be free to worship. On July 24, 1847 when Brigham Young first saw the Salt Lake Valley, he declared “This is the right place, drive on.” Within the week, the advance party had established a site for the Mormon temple and planted crops. 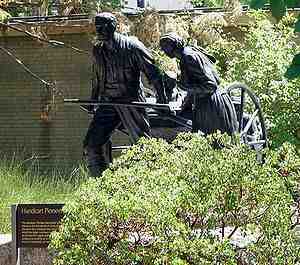 Over the next few decades, more than 70,000 men, women, and children made the grueling 1,000-mile-long trek to Utah. The poorest made the journey pulling handcarts with only the bare minimum of supplies to see them through. Once they had established their home, the church leaders wanted to insure that the Mormons would have self-governance. The Council of Fifty, the civil governing body, first petitioned the Congress of the United States for territorial status. Fearing that territorial status might result in the appointment of governors from outside the Mormon community, the Council soon petitioned for statehood for Deseret. The Constitution of 1849, patterned on Iowa’s, was written to establish that the Mormons were following traditional political processes. 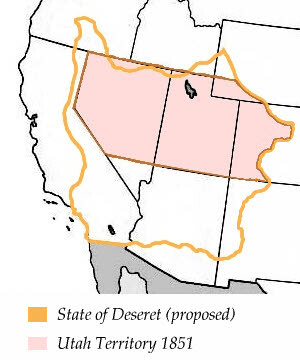 The proposed state of Deseret would have incorporated large parts of what became California, Nevada, New Mexico and Arizona (See map). Deseret’s bid for statehood failed because California had already applied for statehood, the slavery issue had not been resolved in the East, New Mexico’s territorial efforts were being pushed, and there was a western boundary dispute of Texas. President Millard Fillmore signed the Utah Territory into existence on September 9, 1850 and appointed Brigham Young territorial governor soon after. Utah became a state in 1896 with a constitution that granted women the right to vote. Thanks, never heard of this. You continue to educate.